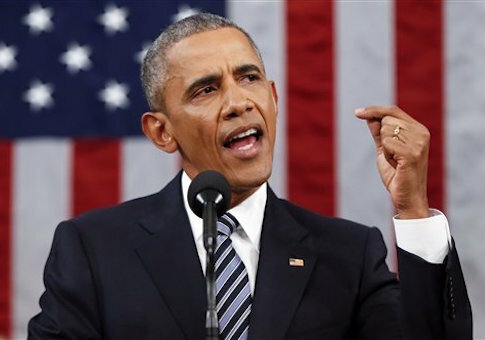 President Obama referred to Ukraine as a client state of Russia’s in his State of the Union address on Tuesday night, eliciting criticism from some U.S. lawmakers and analysts who noted Kiev’s independence from Moscow and ongoing battle against Russian-backed separatists. Despite Russia’s anemic economic growth, Obama said the Kremlin "is pouring resources in to prop up Ukraine and Syria, client states that they saw slipping away from their orbit." "The international system we built after World War II is now struggling to keep pace with this new reality," he added. The president’s actual remarks differed from his prepared text released by the White House, which simply stated that Ukraine and Syria are "states" that Russia views as "slipping away from their orbit." Some observers speculated on social media that Obama misspoke or the speech contained a typo, and the confusion was picked up by Russian propaganda sites. The inclusion of "client" in Obama’s actual speech rankled other commentators amid Ukraine’s existential struggle against Russian encroachment. After pro-democracy protests led to the ouster of pro-Russian leader Viktor Yanukovych in February 2014, Russian forces responded by invading the country’s Crimean peninsula. Since April of 2014, rebels backed by Russia have waged an insurgency against Ukrainian forces in the eastern part of the country, resulting in more than 9,000 deaths. President Petro Poroshenko has vowed to continue to fight against "unprovoked aggression" from Russia. Rep. Peter Roskam (R., Ill.) said in a statement that Obama neglected "geopolitical reality" in his speech. "Israel, our dear friend and the only free democracy in the Middle East, wasn’t mentioned at all during the speech," he said. "Our friend and ally Ukraine was inexplicably referred to as a Russian ‘client state.’ This reflects a lack of understanding of geopolitical reality." Steven Pifer, a former ambassador to Ukraine who is now at the Brookings Institution, tweeted that Obama’s use of "client" for Ukraine was an "odd line." "More like Moscow pouring resources in to destabilize Ukraine," he said. "As #Ukraine defends itself & pursues reform, US & Europe can, should do more to help. It’s about Europe’s security as well as Ukraine," he said in another tweet. A senior administration official did not say whether the line was intentional but noted Russia’s longtime efforts to exert influence in neighboring Ukraine. "The president was referring in his remarks to Russia’s previous long-term efforts to bolster the regime of former President Yanukovych as a way to prevent Ukraine from pursuing further integration with Europe, and its current occupation of Crimea, extensive efforts to support armed groups operating in eastern Ukraine, and other efforts to destabilize the country," the official said. "The United States remains firmly committed to helping the Ukrainian people build a country that is peaceful, prosperous, and free to chart its own destiny," the official added. Some Ukrainian officials downplayed the significance of Obama’s remarks. "It is important to make the right emphasis in assessing this comment," Svitlana Zalishchuk, a member of the Ukrainian parliament, told Radio Free Europe/Radio Liberty. "This is an error on the expression level, a failed impromptu. It shouldn't be considered as the position of the U.S. president on Ukraine." Obama also said in his speech that the United States would continue to "help Ukraine defend its democracy," Zalishchuk noted. Still, the Obama administration has faced a torrent of criticism for declining to provide lethal arms to Ukrainian forces as Russian troops and weapons remain in its territory. While the United States has sent millions of dollars in nonlethal equipment to Ukraine’s military, some of it is antiquated, including decades-old Humvees and secondhand bulletproof vests, the Washington Post reported in November. "If the Americans are going to send us equipment, don’t send us secondhand stuff," one Ukrainian special forces commander told the Post.